Glenn's second project located at the Listel Inawashiro Hotel began in December of 1995. This intriguing project required Glenn to visit Japan once a year for 12 consecutive years. 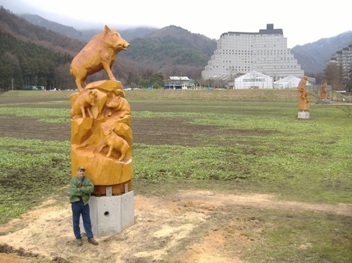 Each year he created one 5 meter tall sculpture from an exported British Columbia log depicting the upcoming years' Japanese Zodiac symbol. These sculptures are proudly displayed in the hotel's Herb Garden. Glenn feels honored to have such a meaningful project that reflects the Japanese Culture and their appreciation of wood and art. Over the twelve years Glenn befriended many of Listel's staff and return visitors. One unique friendship he developed with a commercial house painter who donated his time to help Glenn prep and paint eight of the zodiac sculptures, Mr. Ogawa, was a very helpful person to know. He was a tradesman who could help him find tools and source out materials that the hotel staff might not understand. A special mention to the staff, who did everything they could to make the project stay on schedule. DVD slide show for $10.00 or his 60 minute DVD documentary for $20.00 - includes shipping. Contact Glenn to order your copy today. Copyright © 2012 Grenn Greensides. All rights reserved.